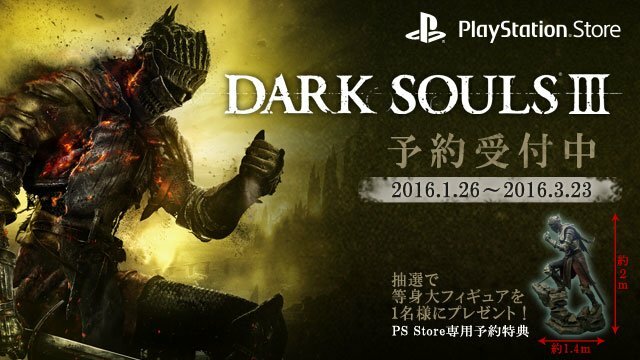 Dark Souls III, the new entry of the series created by From Software launching in a few months on consoles and PC, has been made available for pre-order today on the Japanese PlayStation Store. Alongside the game’s Original Soundtrack, all those who pre-order the upcoming action role playing game will also have the chance to win a rather exclusive figure. What makes this figure really interesting is that it will be a life-size figure of a knight measuring 196 × 140 × 90cm (height × width × depth). To get the chance to win this unique figure, customers will need to get an application ticket from the Japanese PlayStation Store before March 23rd. A few weeks ago a Dark Souls III promotional pamphlet has surfaced online. The pamphlet highlights some of the game’s features and also shows screenshots from the game. Also shown in the pamphlet are the Japanese pre-order bonuses such as the Deluxe Map and original soundtrack CD. Dark Souls III is the third entry of the popular series developed by From Software. The new game, which is being directed by series’ creator Hidetaka Miyazaki, promises to be the best entry of the Dark Souls franchise thanks to a variety of new features and enhancements such as a much faster combat speed, a renewed focus on the role playing elements, an improved character builder, a smaller but better connected world and much more.